Ever get a craving for something melty and cheesy, but don’t want to spend your night with a bellyache? This recipe will satisfy even the most serious cheese craving, all without an ounce of dairy. Zucchini stands in for pasta noodles in this lasagna, and butternut squash packs a healthy dose of beta carotene and vitamin C, and gives the dish a delicious fall flavor. Vegan, gluten-free, and simple to make, this lasagna will be one of your favorite cozy meals this fall and winter. First, get the tomato sauce going so all the flavors can blend and get to know each other. Heat your olive oil over medium in a sauce pan, and add the minced onions. Saute for 5 to 7 minutes until the onions are tender and starting to brown. Add the garlic and cook for another minute or two. Add the chopped tomatoes, the salt, pepper, and red pepper flakes if using. Stir everything to combine, and let this cook uncovered for 15 to 20 minutes, until the tomatoes have softened and most of the liquid has evaporated. Add a splash of red wine if using, and season to taste with salt and pepper. If your tomatoes are under-ripe, add a drizzle of honey to bring out a little sweetness. Turn off the heat and set the sauce aside. Next, blitz up your faux ricotta. Combine all ingredients together in a food processor, adding more water as needed, and scraping down the sides of the mixer and blending until you have a fluffy, creamy, smooth mixture. Season to taste, adding more salt, pepper, or lemon juice as needed. Finally, slice your zucchini and butternut squash and get ready to assemble. 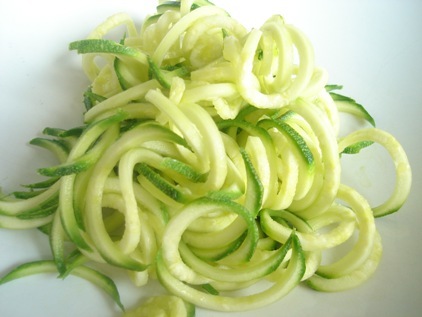 Slice each zucchini in 1/2 widthwise, then cut each half lengthwise into 1/4 inch strips. If you’ve got a mandolin, use it here. You’re going for a lasagna noodle-like shape, so use that as your guide. In your baking pan, add a few tablespoons of your tomato sauce and spread evenly. Next, add a layer of the zucchini, laying them down like noodles, followed by a handful of spinach, a few tablespoons of butternut squash, a few tablespoons of the faux ricotta, and a handful of the mozzarella. Spread each layer evenly making sure to get to all the corners. Continue adding your layers, sauce, zucchini, spinach, squash, ricotta, and mozzarella until you reach the top of your pan, ending with the sauce layer and covering everything with a handful of mozzarella and a few shakes of nutritional yeast. Bake in the oven for 35 to 45 minutes, until a knife inserted into the pan comes out hot. Let the lasagna stand for a few minutes, then slice and enjoy!